The government of Canada has notified the NTSB of an accident involving a PIPER J3C airplane that occurred on March 30, 2019. The NTSB has appointed a U.S. Accredited Representative to assist the government of Canada's investigation under the provisions of ICAO Annex 13. All investigative information will be released by the government of Canada. 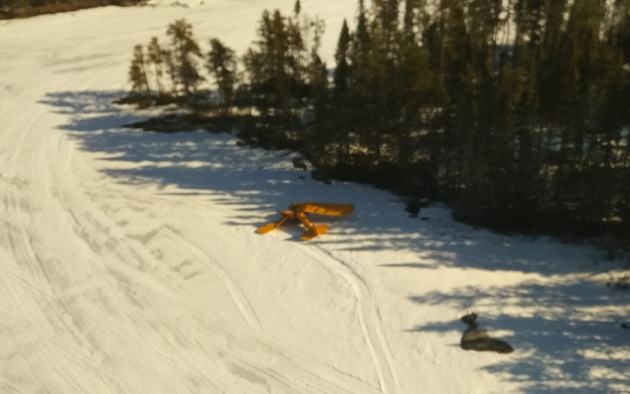 KENORA, Ontario — The Transportation Safety Board says the single-engine plane involved in a fatal crash landing north of Kenora on the weekend went out of control on the final approach to Snowshoe Lake. A TSB spokesperson says a team that conducted an initial investigation at the crash site 60 kilometres from Kenora has returned to Winnipeg with some preliminary findings. They determined that "control was lost and the aircraft collided with the frozen ice surface," Eric Collard told Tbnewswatch in an interview Tuesday. It is not yet clear what led up to the Saturday afternoon collision, which claimed the life of the 65-year-old pilot and caused critical injuries to a 26-year-old passenger. The ski-equipped, privately-registered Piper J3 Cub had flown from Minaki to Snowshoe Lake. TSB investigators removed some items from the aircraft for examination at the board's facilities in Winnipeg. "We are still assessing the occurrence, which means we haven't determined what level of investigation we're going to be doing on this," Collard said. Ontario Provincial Police received a report of a plane crash at Snowshoe Lake, approximately 63 kilometres north of Kenora at 1:30 p.m. Saturday March 30. Due to the remoteness of the crash site the International Emergency Response Coordination Centre was contacted to assist with determining exact coordinates of the crash site for emergency responders to locate the aircraft. Orng officials confirmed in an interview with the Canadian Press that an air ambulance was dispatched to medevac a critically injured person to Lake of the Woods District Hospital. Kenora detachment OPP confirmed Monday. April 1 that the 65 year old pilot of the Piper J3 Cub was deceased and the 26 year old passenger was in critical condition. Kenora Detachment members along with the Forensic Identification Unit (FIU) and the Emergency Response Team (ERT) assisted with the investigation. Ontario Provincial Police have confirmed that the pilot of a single-engine aircraft that crashed at Snowshoe Lake on Saturday was fatally injured, and a passenger suffered critical injuries. The Piper J3 Cub went down early Saturday afternoon, 60 kilometres north of Kenora. The deceased pilot was 65 years old. The 26-year-old passenger was taken to hospital. In a statement Monday, OPP said that due to the remoteness of the crash site, the International Emergency Response Coordination Centre was contacted to help determine exact coordinates for the emergency responders. The Transportation Safety Board of Canada has deployed a team of investigators to the crash site.